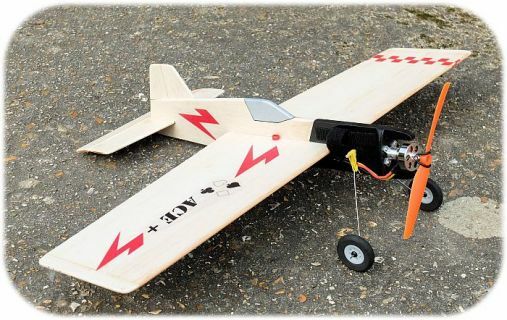 The ACE+ trainer package consists of a laser cut balsa and ply kit and hardware plus a pre-wired plug and play electrical system, it is easy to build and fly, clean and quiet and great fun. Only simple hand tools, finishing products and a battery are required to complete the model. Motor speed and flight duration are adjustable with programmable flight times as low as 10 seconds for those all-important first flights. A start delay feature allows solo operation…..
Wing Span 23 inches….Line Length 20 to 25 feet…..quiet and mess free…….perfect for the local park. This page was printed from www.densmodelsupplies.co.uk on Tuesday 23rd April 2019 at 12:41 am.